I have always been proud of my Paleo "Chick-fil-A" nugget recipe from a couple years back, and it has definitely been a hit with readers. If fact, I'm sure a few of you stumbled upon my little blog because of them. 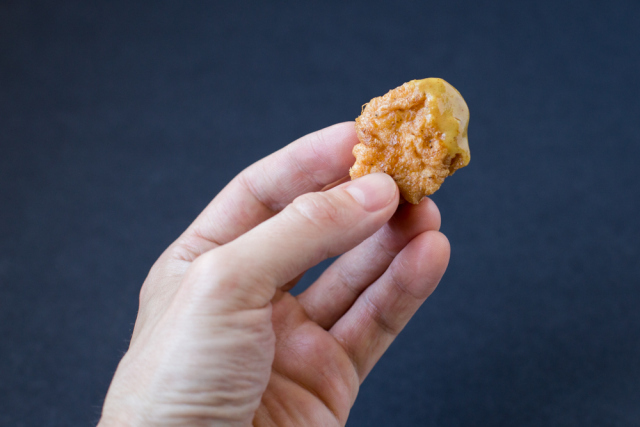 But to be honest, I've never been satisfied with the texture of the nuggets themselves; while they are very similar to the thin coating that you'll find at Chick-fil-A, I personally prefer a spongier breading around my chicken nuggets. So while experimenting with breading techniques for a different recipe, I happened upon my eureka moment -- something I like to call "reverse battering." You see, I've always been taught to bread meats using a liquid-then-flour (or flour-liquid-flour/breading) method. Sounds logical, right? It'd be just crazy to not put flour or breading on nuggets before frying them. But after some YouTube surfing for Chinese recipes, I noticed that sometimes people would bread their food with starch and then egg before throwing it in the oil. Turns out it's a genius idea for getting a light, crunchy, and satisfying texture for nuggets without having to deal with that whole pesky "wheat flour" or "breadcrumbs" stuff. The trick is in not heating the oil too hot, so as to keep the egg from burning; medium heat works perfectly. 2. Preheat your oven to 250 F. On your stove, warm the lard or coconut oil in a cast iron skillet over medium heat for 3 minutes. In a mixing bowl, toss the chicken pieces with the starch mixture until evenly coated. With your fingers, dip a starchy chicken piece in the egg, shake off the excess egg (eggcess! ), then carefully add it to the oil. Repeat until you have filled your skillet; be careful not to overcrowd the chicken pieces. Fry the chicken until cooked through, flipping every 2 minutes, about 6-8 minutes per batch. 3. As you finish each batch, place the cooked pieces on a plate lined with paper towels; put them in the oven to stay warm. You should be able to cook the chicken pieces in about 3 or 4 batches, depending upon the size of your skillet. The oil should reach halfway up the chicken pieces while cooking, add more oil if needed. Be sure to watch the heat, as the skillet will get warmer over time; adjust heat as needed. You're looking for an oil temperature around 350F. Use a splatter screen to prevent splattering. ** Use this technique as a basis for other nugget-like recipes. For instance, some recipes would taste better without pickle juice; in those circumstances, marinate the chicken in 1/2 cup water mixed with 1 tbsp kosher salt. ** While I think oven-roasting my older nugget recipe turns out pretty good, this recipe wouldn't fare well in the oven. Another cool thing about this technique is that it uses half the starch you'd typically use in a nugget recipe, despite the fact that it feels like you're eating more breading than usual. Eggs are pretty awesome like that.